"Don't say it too loudly, but I think I'm halfway. This is surely a significant psychological milestone. I am not sure what feelings this will bring, but each mile covered will now seem like a mile closer to the finish, instead of a mile from the start. Isn't that like going downhill instead of uphill?" These words I scribed on my PDA in the evening, using the tiny stylus and gawking at the small screen. I calculated that I'd covered 480 miles in 30 days. That compared with 475 miles planned on my maps before I left home. Extrapolating, if I was able to complete this hike, my distance to John o’Groats would be about 950 miles. Today, I had moleskin back on one of my toes. This special bandage is thick enough to protect a blister while abrading in its stead. The heel repair on my boots had been effective, but Mr. Duckett chose to build up the very back of the heel rather than just thicken up the heel contours that were there before (with a rounded-off heel). As a result, each step involved a rather abrupt heel contact, which then affected my calves. I hoped that the new heels would round off with wear, and that my calf muscles would meanwhile adjust to their new duties. It was only nine miles into Kendal, where I arrived in the early afternoon. Nevertheless, I felt the calf strain. After a foray into town, I decided to rest my legs for the rest of the day. This was partly because tomorrow would be a pretty fatiguing, long uphill affair. 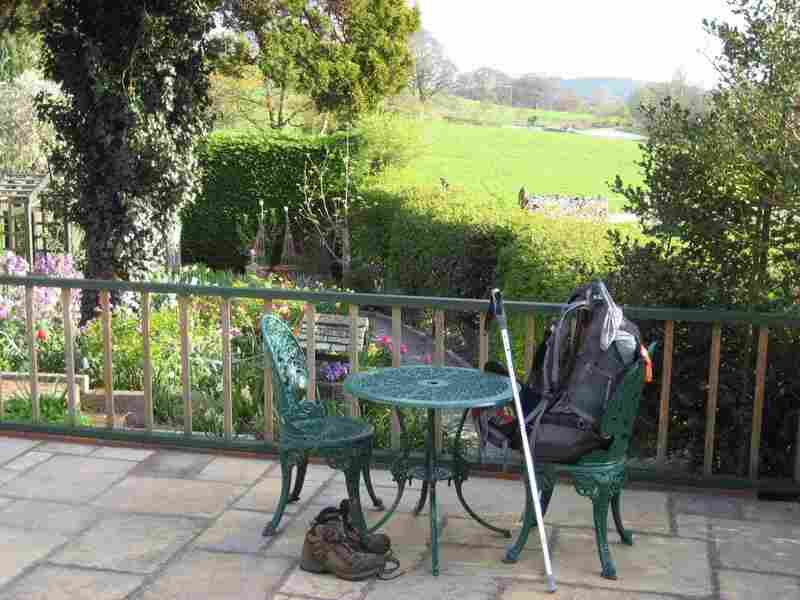 Tom Whitehead at last night's Bluebell Cottage gave me some useful route advice, enabling me to take a country lane after Levens Hall, a notable country manor with a topiary, and to depart the busier A6. I have to tell you that the A6 footpath this morning was a leafy off-road trail in parts, and not at all a problem. Highways are invariably busier than lanes and trails, but occasionally are very pedestrian-friendly. Reaching Kendal at lunchtime, and my destination for the day, I bought a sandwich at Tesco, Britain's most successful supermarket chain. Along with the salmon-and-cucumber sandwich, I bought some plums, and my customary liter of water or juice or ginger ale, which I currently force myself to drink each day before lunch because my urine tells me I need it - over and above the other liquids I drink each day. Now it is the British who are partial to cucumbers in a sandwich, but I encourage Americans or anyone who hasn't tried them to do so. Properly made, a cucumber sandwich should have thinly-sliced, peeled cucumber covering the entire bread area. This necessitates some trimming or doubling-up of the cucumber slices so that they reach to the corners of the bread. Of course, one must be careful when cutting the sandwich into halves (or quarters) not to displace the cucumber slices, which isn't difficult to avoid with use of a sharp knife in one hand if you hold the bread down with your other hand and avoid cutting off your fingers. Of course, the sandwich must be fresh. The cucumber must be crisp and not soggy. And it must never be frozen, which is a self-respecting cucumber's worst nightmare. 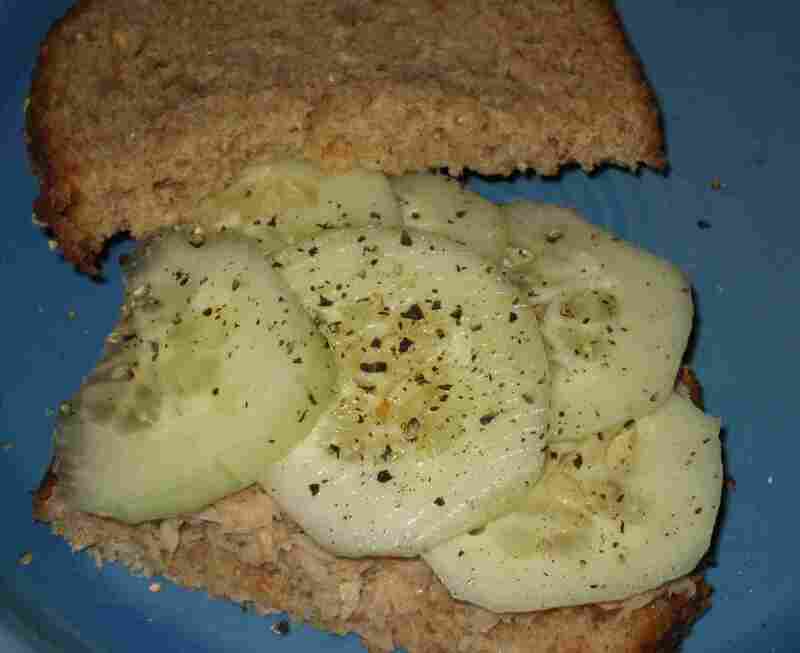 With salmon, tuna, cheese, ham or most anything else, fresh cucumber adds a literally-snappy texture to a sandwich. But don't buy it from Tesco. 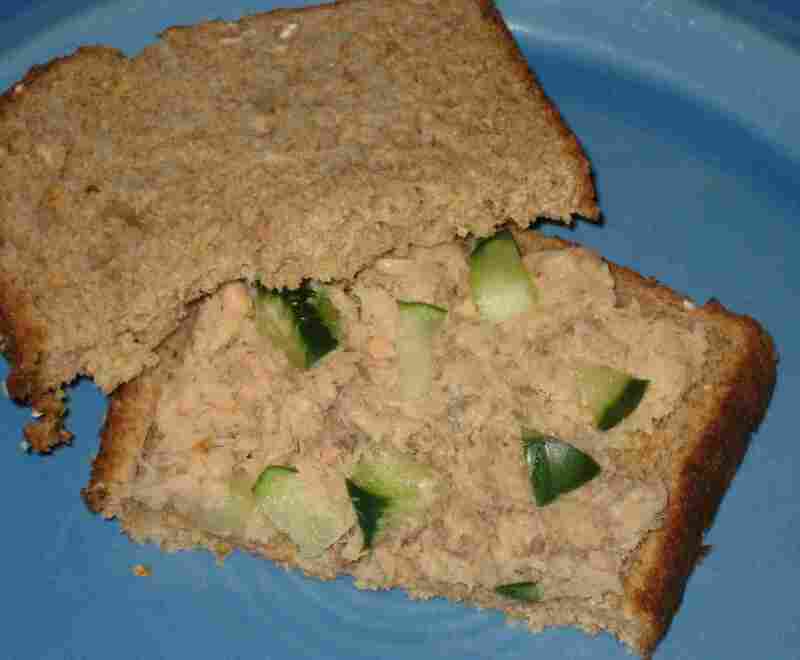 My sandwich had just a few not-peeled, small cucumber chips mixed in with the salmon. They must have done it this way so they could spread the combined ingredients on to the bread together, and never have to lay the cucumber slices on the bread by hand, let alone into the corners. The paucity of actual cucumber slices meant that cucumber just wasn't there to be bitten into as expected. This is a serious breach of cucumber sandwich protocol. To a cucumber sandwich lover, today was a terrible, horrible, no-good, very bad day. Now I'm not one to carry things to extremes. Only very rarely is a gripe worth re-telling, and a joke even less so. But the matter of the cucumber sandwich preyed on my mind for a while, in fact until November. At that point, I set about reconstructing the Tesco sandwich in my kitchen, and compared it with a cucumber sandwich of my own making (and I'm by no means a cook). The photos are below. My downtown-Kendall visit was to buy a toothbrush, some iron rations (sardines, cheese and chocolate), and some fruit, and I indulged in a couple of cans of Strongbow cider as well. But the main reason was to visit the Tourist Information Centre to find accommodation for tomorrow night. Tomorrow, I expect to be in Shap, a town just beyond the top of a mountain pass known for bad weather. I must have shelter there. I booked at the Greyhound Hotel, and hope to do the 17 miles from my Kendal B&B to the Greyhound without a problem, though I have some foreboding. As far as I know, Shap is the only place to find accommodation between Kendal and Penrith, one of the more desolate stretches of road in England. It will be Friday night, sometimes busy with leisure travelers, and I can't afford not to have assured accommodation in this particular desolate area - even if I've risked that in other places. I am truly in the north of England now, and have been for the last week. The people are said to be more outgoing, and I seem to have an easier time getting a conversation going with strangers. Perhaps the dogs are friendlier too? I am sure that I have been barked at less these last few days.